Are you ready to Hit It Big? Welcome to Hit It Big – your favourite retro game show ever! Join our amazing host, with the excited audience the contestants are all ready! So hit that button and spin those reels. Will you Hit It Big and reach the highest bonus level? The grand prize is up for grabs! Every spin of the button not only delivers an exciting reel spin, but also combines that with a chance to trigger additional reel features to maximise your win. Hit It Big is a 5 reel, 3 row slot in the ELK Classic Series. With 5 paylines this game holds the traditional attributes of an analogue retro slot machine, updated with modern visuals features and special effects. Get ready to Hit It Big! The base game is a traditionally styled 5 reel, 3 row slot. Above and below the reels are a set of bright feature buttons which display different features. Every time the player spins the reels the buttons offer up a new set of possible features. Any pair of matching features between the upper and lower buttons trigger that reel feature. Depending on which features are matched together with the outcome of the reel spin a multitude of different outcomes are possible from each and every spin. 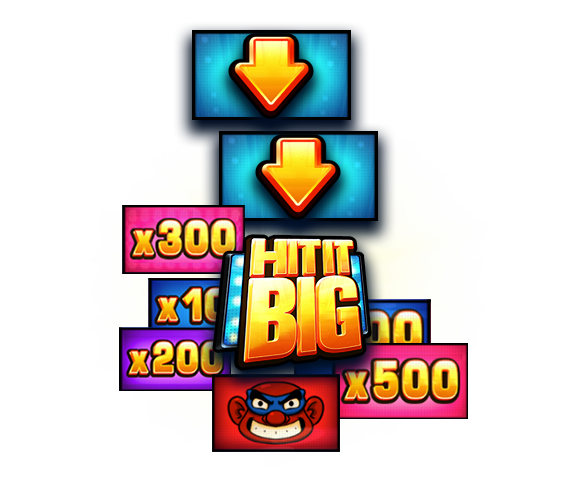 The Hit It Big Bouns game is a three stage bonus game. By progressing from the outer circle all the way to the center and avoiding the bandits, you stand a chance to win up to 1000x your bet! Awards the player with the presented bet multiplier. If the reels show no win the feature has no effect. Awards the player a re-spin. All feature buttons except already triggered feature buttons are also engaged again. All reels have a set of stacked wilds. When the Stacked Wild feature activates on one or more reels those reels stop on the stacked wilds. The stacked wilds will only come into play when this feature is engaged. The Locked Wild feature ensures that the leftmost and rightmost reels lock on the stacked wild position for three spins. This creates the effect of a three reel slot machine that pays out like a five reel machine. All feature buttons except already triggered feature buttons are also engaged again. The first ever televised game show was called Spelling Bee. It broadcasted on 31st May 1938, and transmitted live from the BBC studios at Alexandra Palace. For the optimal gaming experience, ELK Studios recommend launching the game in 1600×900 resolution. If scaling is required, use 16:9 ratio.